I had some vinyl on my truck's rear window to advertise my Etsy store, It said www.PeaceLoveandArtshop.com and now with the new car I decided to go a little more fancy. 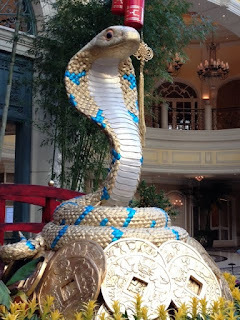 I asked Steve at www.702graphics.com here in Las Vegas to whip me up something. 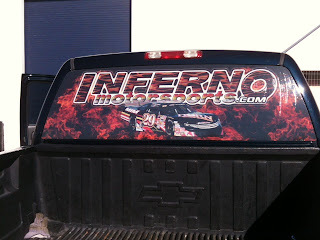 He is the one that designs the graphics on our racecars, check out the website for www.702graphics.com and see all the stuff they cover, Wow! Oh, and one of our racecars is in the gallery as well! 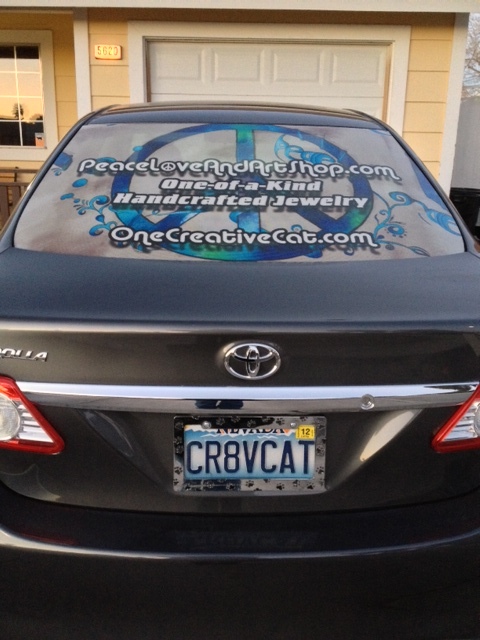 Last week he had finished and installed my screen, I just love it!! 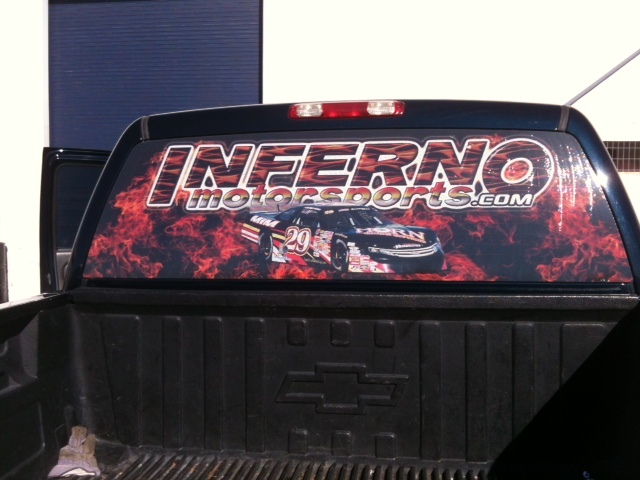 Steve also designed one for the truck, since the truck has been retired, it will now function as a race car hauler, so the screen now features our race team: www.Infernomotorsports.com! Cool! Steve also designed the graphics on the racecar you see in the screen! I finished the kitchen table! 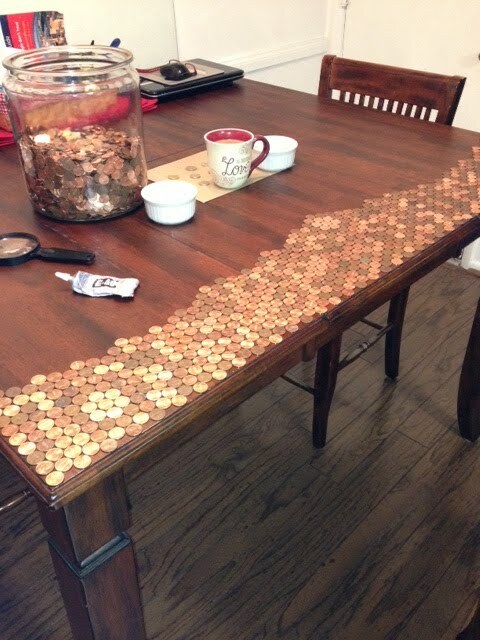 It took about 30 hours total and used 6432 pennies!!! The pictures are really hard to take with the reflection on the glass, etc. but it is really cool looking! Ok, gotta find something new on Pinterest to keep me busy! See you again real soon! 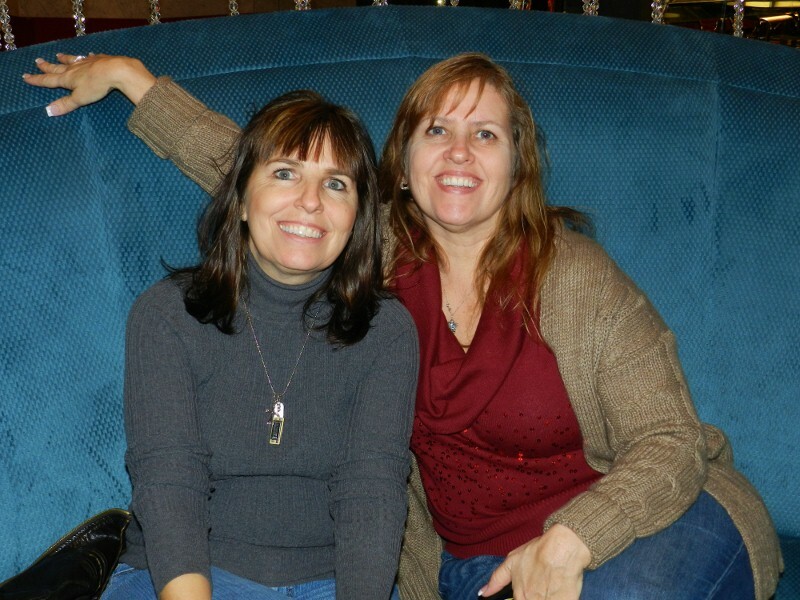 My sister came to town for the weekend, wow, we really crammed a lot of fun things in only 3 days! Friday she arrived and we decided to go to bingo, she had brought me a little gift, a clover necklace, so I put it on and promptly won 100.00! 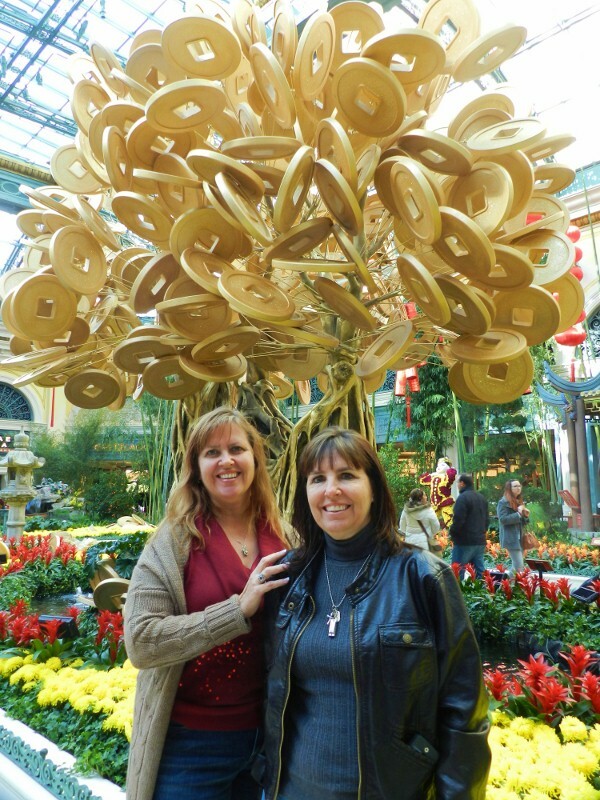 After that we met up with Tanya for a lite lunch then headed home to relax before dinner. When Charlie got home from work we headed to The Cheesecake Factory to have Ahi tuna and Salmon and Cheesecake all around, I had a bite or two of Lemon Raspberry, Christy had the Mango Cheesecake and Charlie had the Vanilla Bean! 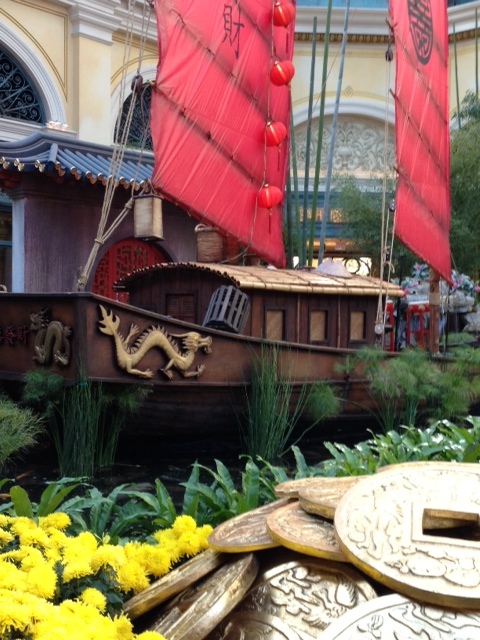 Then we headed to green Valley Resort to play some slots! No big wins so we headed home. Saturday we went to breakfast and manicures, Christy decided to get acrylics put on so we had to come back Sunday for that, so I decided to make a haircut and color appt! We left there and made our way to the big antique mall on Charleston and Decatur, we found some small trinkets and then headed home to rest before dinner and our concert. Charlie arrived home and we left for the Orleans where we like to eat at TGIFridays, we met up with Tanya as she was going to the concert with us, then James showed up so Charlie would have someone to hang out with while waiting for us to finish seeing GREGG ALLMAN at the Palms! Yes, we three girls got to see Gregg Allman! He was great and sang all the good ones from the Allman Brothers band, My personal favorites which he saved for last are: One Way Out and Whipping Post! Wow, what a fabulous night that was! We all went home happy humming Sweet Melissa! Sunday found us up early to go get Christy's nails and my hair done. I went shoulder length short, dark brown with caramel/cinnamon highlights! Big Change for me, I think I will enjoy the shorter hair. 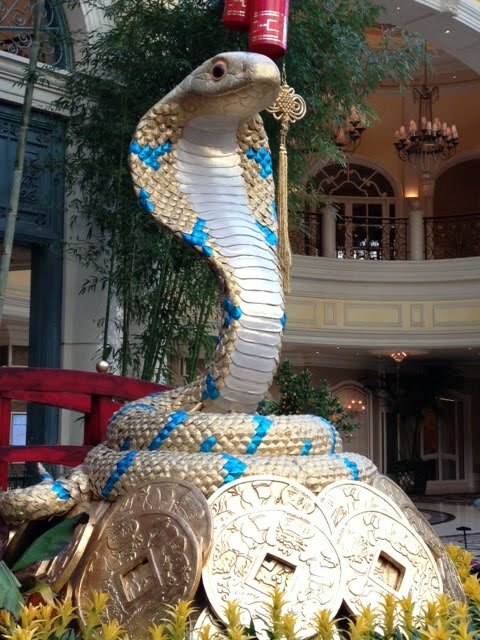 After our beauty treatments Tanya showed up to drive us to The Bellagio to see The Year of The Snake exhibit. That is my Chinese Zodiac sign! We wandered around then went next door to show Christy the Cosmo, we sat down in the Chandalier bar and had coffee and chatted, then we all headed home. I made Christy fish tacos for dinner and we wanted to play pool but a cold front came and in and we just couldn't stay out there even with the heaters going! She flew home Monday morning! What a fun trip that was! I have time between calls and data entry at the office, what better way to kill time then to peruse Pinterest?? Oh My, I have found some great recipes (Chicken Chipolte Enchiladas for one, recipe in older post) I have found beautiful quotes, pictures and some very hilarious videos, cartoons, ecards. 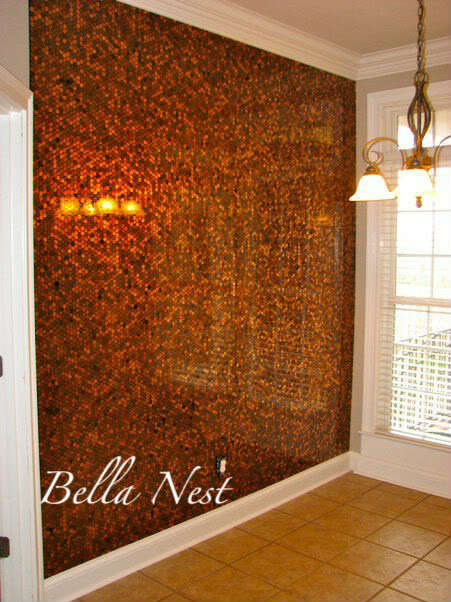 Well, the other day I came across a photo of someone doing something to their dining room wall, I clicked on it to take a closer look and went to this blog: Bella Nest: Out of the Ordinary Nook Wall where I saw that they were covering the wall with pennies!! It was beautiful! I thought that would be so cool, but I did not want to do a wall, instead I chose my dining room table! We have always covered our wood tables with a sheet of tempered glass (harder to break) so I already had a cover, just need to add pennies, luckily, I have a huge jar full! So I began the process, stay tuned to see the finished result, should take about a week of an hour or two a day of gluing! I will be hiding the oldest penny I have, so far it is a wheaty from 1945, making flowers, putting a row of our birth years and our kids birth years, adding some foreign coins in the center (my trip to europe coins). I am really having fun! My husband thinks I am nuts but I don't really care. My start! That took about 3 hours! I am having so much fun finding wines to try out and to stock my wine cellar with! Yes, it is my wine cellar, stores my wines at 55 degrees until ready to drink. It's my kitchen, my rules! So back to the wine cellar, I have been travelling near and far to find wines I like. 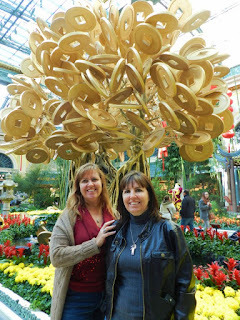 The Far, being Cost Plus World Market, Holy Moly, it was like going on a pilgrimage! But I made it, all 36 miles away! It was worth it, I loved all the wines they had, and soup kits and trinkets and goodies from around the globe! Fun fun fun! I bought 4 wines and some soup (hearty chicken noodle, it was fabulous). I also read all the labels at the grocery store, and some days I venture to Lee's discount liquor. I am always searching for a good Pinot Grigio, or Riesling, I love the ones that are crisp and refreshing, with pear and apricot! Yum! I was just browsing my selections to find a wine to go with my roasted chicken and vegetables (recipe from Ina Garten via youtube) and decided on a nice Riesling by Fetzer, when I happened to notice a little trend going on in my wine cooler, seems I have chosen wines with names like : Starling, Castle Rock. Names from some of my favorite horror genres! Starling from the Hannibal fame, "Clarice do you still hear the lambs?" or Castle rock from Stephen King fame, the home of Cujo! Ok, I just gave myself chills, time to go eat my dinner and peruse more wine ratings on youtube, perhaps I will fine one called "The Ring" or "Shining" ....muhahahahahhaha!!!! 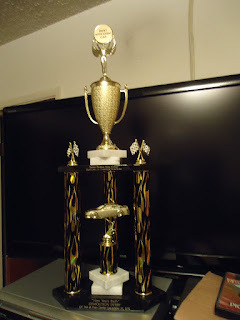 My son is a derby car driver, he got that trait from his father, Bill, he was the Derby King of Ascot Raceway in California years and years ago...so I guess that makes Travis the Derby Prince? Anyway, On New Years eve they had a Derby in Orange County, this is the car Travis built and drove, the paint job won him Best in Show! He finished 5th in the race due to getting stuck on another car and was unable to move any longer! I think it is so cool that he can go out and play and have fun crashing up cars, what a way to unwind after working all week! hahaha!! 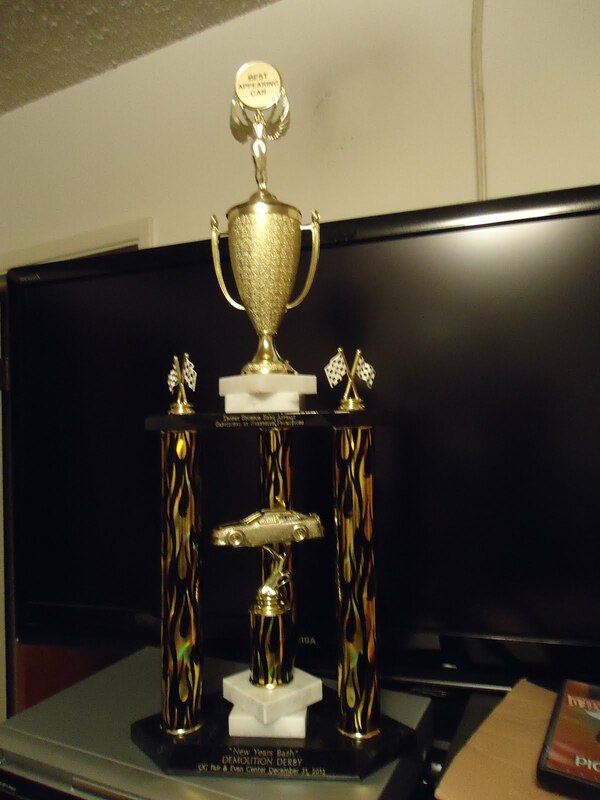 The trophy for BEST OF SHOW CAR! I made these enchiladas tonight, they were really good! The chipolte sauce gave them a great flavor, Charlie really enjoyed them and we will put this recipe in our favorites! Lightly spray the bottom of a 13×9 baking dish and set aside. Preheat your oven to 400 F.
In a large skillet over medium heat add the two tablespoons of olive oil. Add in the minced garlic and cook for one minute. Add in the flour, cumin and the tablespoon of diced chipotle peppers, stir. Whisk in the broth and water. Add in the tablespoon of adobo sauce if desired and simmer over medium heat until the sauce has thickened. Season with 3/4 teaspoon kosher salt and 1/4 teaspoon black pepper. Put the shredded grilled chicken in a bowl. Add a couple spoons of the “enchilada sauce” to the shredded chicken. Spread some of the sauce in the bottom of the prepared pan. Spoon a little of the sauce, chicken mixture, and cheese, down the center of each tortilla, then tuck and roll each tortilla and place it seam side down into the baking dish. Pour and spread the remainder of the sauce over top of the enchiladas and top with rest of cheese. Bake, uncovered, in your preheated 400 F oven for 15 minutes or until the cheese has melted and is bubbly. Serve over shredded lettuce and top with chopped avocados and a spoonful of sour cream. One Comment | Be the first to comment! I make a very similar version and they are delicious but mine doesn’t have peppers. I will have to try this one next! 5 Reviews | Be the first to review! 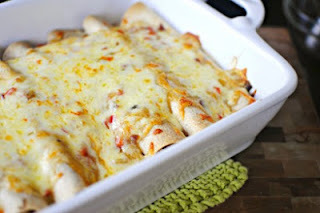 These enchiladas were really good and easy to make! Wow! Usually when I make lightened up versions of the real thing, I assume I’m going to be sacrificing something in flavor. These were incredible! Even better than their full fat counterpart. I was pleasantly surprised. Thanks! Love this recipe, it turned out so well! I added spinach to the meat for some greens, delish! Amazing!!! I dont like red sauce either. I like green sauce but this is amazing!!!!! Cannot wait to make it again. May try with beef?? SO GOOD!! !